Want to lower the cost of your Facebook ads? Curious how connecting with your customers can help? To explore Facebook ad sequences that cost less and improve results, I interview Amanda Bond, a leading Facebook ads expert. Her course is The StrADegy System. She’s a regular speaker at Social Media Marketing World and a HubSpot Academy instructor. Amanda explains why the challenges marketers face in 2019 can create opportunities to lower their ad spend. 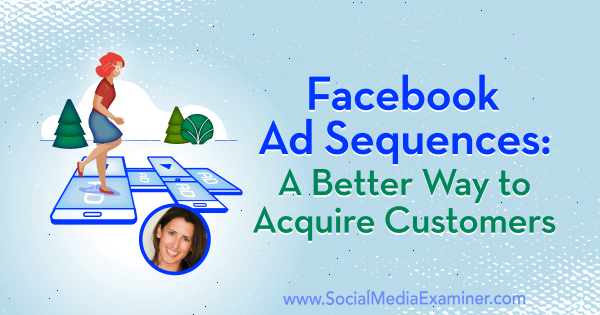 You’ll also discover how to sequence Facebook ads to reflect the customer journey. Read a summary of the interview below. To listen to the interview, scroll to the end of this article. 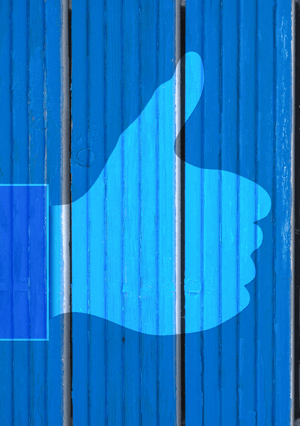 Why Should Businesses Consider Facebook Ads Right Now? Amanda begins with some backstory on what happened with Facebook in 2018. Contributing factors such as Facebook apocalypse and behind-the-scenes changes to the platform combined with diminishing inventory to price a lot of people out of the market. The number of ad impressions Facebook can serve is finite. As we got closer to that limit, the cost to deliver those ads rose exponentially. To explain, Amanda shares some research she did in Q4 of 2018. She found CPM was three times as expensive as it was 2 years ago. As a result, a lot of the big players that were spending hundreds of thousands of dollars a month on Facebook started looking to other advertising platforms. Because these big players aren’t putting their dollars into Facebook any longer, more inventory is available. As a result, the playing field is becoming more even. The CPM is dropping and ad costs feel like they’re normalizing. Which, Amanda says, makes this an amazing time to jump into Facebook ads. In addition to creating revenue through product sales, I remind listeners that Facebook ads can also be used to combat reduced reach by putting content and messages in front of a targeted audience. Listen to the show to hear more about turning posts into Facebook ads. I ask Amanda about other challenges Facebook advertisers may be facing. She refers to the education space around Facebook lead generation ads and moving people into a sales funnel. For the past two and a half years, she says, a lot of amazing people with amazing products, services, and offers have been listening to mentors who talk about pushing people through sales funnels to generate revenue. Essentially, they’ve been taught to serve lead ads to cold audiences of people who don’t know or trust them; immediately asking those people to give up their email address for something that may or may not be valuable. Businesses have become so focused on transacting with people online that they’ve forgotten about foundational basics. When I ask why funnels may not be working as well as they have in the past, Amanda says her research and experience revealed that many funnels are optimized to get a lot of traffic, but it’s often unqualified traffic. Rather than depending on direct lead generation ads or ads that aim straight for a purchase, Amanda suggests amplifying your video content with Facebook ads. These ads let you warm up your audience by sharing your message, values, and mission, and are actually less expensive than lead generation and conversion ads. Then, once people are in your warm custom audiences, you can retarget them with ads focused on lead generation and sales conversations. Listen to the show to learn more about why Amanda believes warming up an audience with the right type of ads is beneficial. What Is a Facebook Ad Sequence? Amanda says there’s nothing revolutionary about her Facebook ads sequencing. It’s built on foundational marketing principles that she breaks into three phases: Connect, Commit, and Close. The Connect phase is when brand loyalty is established. It’s all about branding and engagement. In this stage, you focus on getting people to watch the videos you create. The Commit phase is where 95% of the education about ads is focused right now: lead generation. No matter what industry you’re in, whether you sell online or not, this phase is used to identify potential prospects. It’s all about asking people for an email address or asking them to sign up for a discovery call in exchange for something of value so you can move them to the Close, or purchase consideration, phase. Rather than jumping straight into lead generation ads, Amanda encourages people to think about overall brand goals and specific goals for each product and service they offer. Then the next step is to create an ads sequence that reflects the behaviors of their prospects and customers. Amanda uses the word sequence because the experience is built around what the customer, left to their own devices on your website or in your email series, will naturally do. It’s a process of identifying how people engage with you organically and then serving ads that are triggered by that user behavior, which is where custom audiences come in. Here’s an example beginning with the Connect phase. Someone sees an episode of the Social Media Marketing Talk Show on Facebook on a Friday. They are busy so they only watch a few seconds, but want to remember to go back and watch it. And a segment of the audience might come back and find that video, but life happens, right? 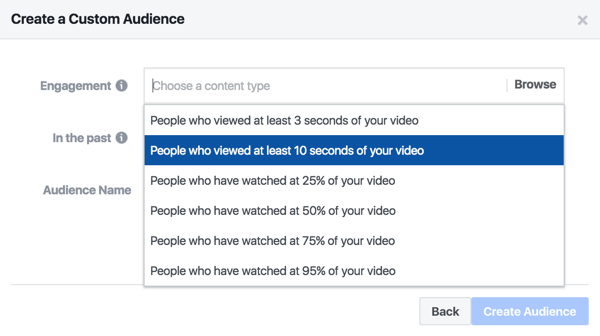 Instead of hoping that person will remember to come back and watch, you amplify that live show with a Facebook ad that targets people who watched at least 10 seconds of the show. The ad encourages people to continue to watch on Facebook or uses some clips from the show to get people to view the companion blog post that covers it on the website. You also retarget people who watched 95% of the show with a reminder for the next episode. In the Commit phase, you move to acquire an email address in return for a free download of the annual Social Media Marketing Industry Report. You then move people who opted to receive that download into the Close phase by retargeting them with videos that highlight different elements of Social Media Marketing World and inviting them to come hang out with you in person. Amanda shares that she studied $48,000 in ad spend and found that serving lead generating ads to warm custom audiences is 50% to 100% cheaper than running lead generation ads to cold traffic. And that’s why the Connect phase of ad sequences is so important. You’ll initially spend more on several different ads you create, but when you deploy the Connect, Commit, and Close phase ads sequentially, you can halve your cost per customer acquisition. Because by the time people go through the Connect phase (get to know you) and enter the Commit phase, they already know and trust you and they’re more receptive to your offer. Which means they’re more likely to take action in the Close phase. 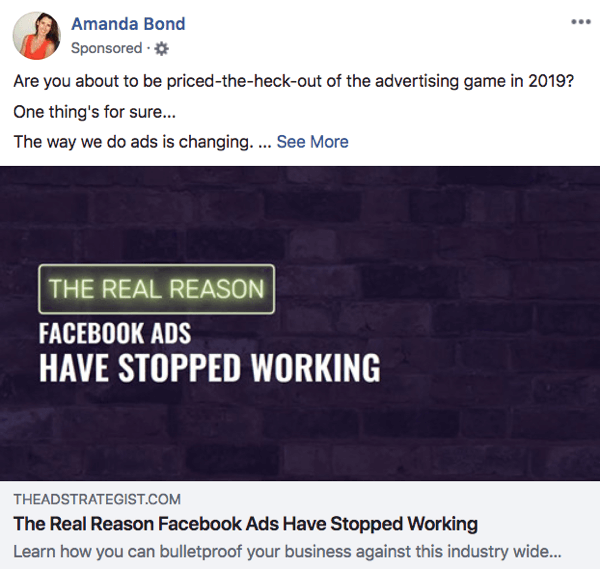 On average, Amanda puts 20% of the Facebook ad budget into supporting the Connect phase ads that run 365 days a year. 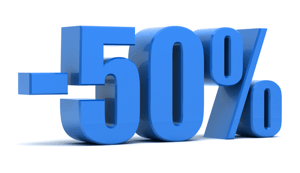 She says that 40% to 50% of the budget goes into running the Commit phase ads—the ads that nurture the people in the Connect phase into giving you their email address. You might use the ads to deliver a 5-day challenge opportunity or ask them to show up for a webinar to learn more about you while you help them solve an issue. The balance of the budget is then put into running Close phase ads to anyone who’s considering a purchase. These are people who have expressed intent by visiting a sales page, for instance. Listen to the show to hear an advanced sequencing tip from Amanda. To start building a successful ad sequence, you want to survey the organic content that you’re posting. Do an engagement audit of all of the text, image, and video posts on your Facebook page to identify a theme or content that’s more engaging than the others. To illustrate, for every 100 people who see a post, you want to know how many of those people are liking, commenting on, sharing, and clicking on the post. When you find the posts with strong engagement, use them to create custom audiences for ad sequence retargeting. In addition to custom audiences based on post or video engagement, you can build custom event response audiences of people who mark Interested or Going to events on your business page; the people in this audience can be retargeted for 365 days. If you have the Facebook pixel on your website, you can also build custom audiences of people who visit your site; the people in this audience can be retargeted for 180 days. When you have solid custom audiences built, you can begin serving people with ads that reflect their behavior. If someone demonstrates an interest in Facebook ad content, you can say, “Oh, okay. If you’re interested in that, perhaps you’d like to see this Facebook ad-related content.” Now they’re connected to you and you can work toward warming them up and moving them through the Connect phase and into the Commit and Close phases. Listen to the show to find out how Amanda adapts her ad sequence for Instagram. To build a Connect sequence, Amanda recommends starting with video ads. She prefers video over static posts because you can capture 3-second viewers. With a static post, people have to like it, comment on it, or share it to enter your sequence. Connect Trigger Video: This is the first contact with your brand for a lot of people. It can be any content that speaks to what your brand is about and how you support people through the customer journey. Connect Video Ad 1: This ad will promote engagement. Connect Video Ad 2: This ad will position you as an authority. Connect Video Ad 3: This ad will share a testimonial. 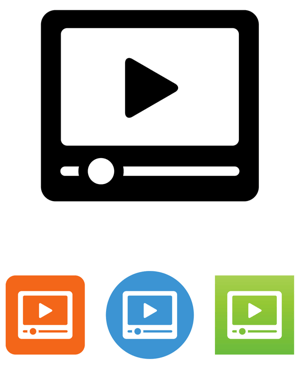 You can use brand-new video or (remember that content audit?) amplify a live stream or other video content that did well. When you set up the campaign, put each ad into a separate ad set. Then tell Facebook to serve the other three Connect ads to people within 5 days of them seeing the trigger ad. Facebook will determine the order in which each one is served based on the available inventory. Anyone who sees that initial video will then see those next ads. That’s your Connect sequence. After people have seen the three Connect ads, you have an audience that’s warm for the Commit phase. After 5-10 days, show a lead generation ad to anyone who watched the trigger video. Amanda says she keeps the Commit phase fairly simple to start with. She tries one lead generation ad, and if that doesn’t work, she tests another one. The goal is to get an email address so you can initiate a sales conversation via email, as well as through Close phase ads on Facebook. Listen to the show to hear how complex and sophisticated ad sequences can become. The LumaFX app for iOS is a powerful, robust mobile video editing app that lets you modify video you’ve recorded or imported. 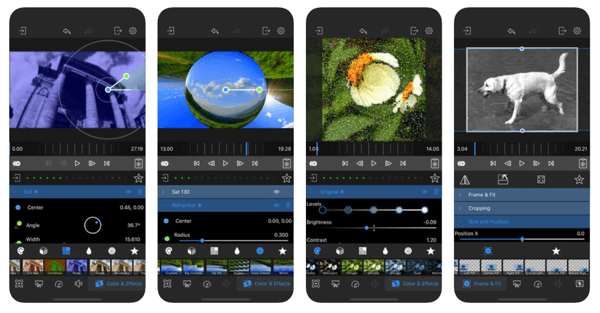 The app has a full array of basic features including the ability to crop, color-correct, and rotate video, as well as an exceptional library of effects you can use to apply fast or slow motion effects—supporting up to 244 frames per second for slow motion animation. Filters, similar to those on Instagram, can be used on their own or combined to create unique filter presets you can apply to clips. The app is intuitive and very easy to use, and costs $2.99 on the App Store or on luma-touch.com. Listen to the show to learn more and let us know how LumaFX works for you. Check out Amanda’s Facebook page, The Ad Strategist. Visit The Ad Strategist website. Learn more about The StrADegy System. Check out Amanda’s HubSpot Academy courses. Tune into The Journey, our video documentary. Learn more about Social Media Marketing World 2019. The Social Media Marketing podcast is designed to help busy marketers, business owners, and creators discover what works with social media marketing. What do you think? What are your thoughts on Facebook ad sequences? Please share your comments below.